Join Us – Become an Admin! Your Chance For Your Catching Fire CH. 1 Artwork Featured On The Hunger Games Facebook Page! Do you love creating fan arts? Do you love Catching Fire? If you had answered “Yes!” to both questions, then here’s your opportunity to show off your Catching Fire artwork to the world and stand a chance to get your artwork to be featured on official The Hunger Games movie Facebook page! You can incorporate photos, drawings, GIFs & video to create an eye-popping multimedia experience inspired by the words of the book in Chapter 1 of Catching Fire by Suzanne Collins and submit it here. Lionsgate has already done so on the brand new ‘The Hunger Games: Catching Fire’ poster which you can check out here. It’s your turn now. What are you waiting for? Time to get your creativity juice flowing! Unfortunately, this contest is only open to U.S. residents who are 13 years and over. Nonetheless, if you haven’t read Catching Fire by Suzanne Collins yet, you can purchase it at any major bookstores in Singapore. Or if you are strapped for cash, feel free to visit any of the regional or public library branches in Singapore. It would be advisable to check the availability of the item first on NLB Catalogue to avoid disappointment. We would advise you to read The Hunger Games by Suzanne Collins first before continuing on sequel Catching Fire by Suzanne Collins for better grasp on the story for there are additional characters and plots not introduced in The Hunger Games movie. The Hunger Games DVD and Blu-Ray are now available. “The Hunger Games: Catching Fire” is tentatively scheduled for release on 22 November 2013 in Singapore. Don’t forget to follow us on Twitter (@HungerGamesSG), Tumblr, email as well as ‘Like’ us on Facebook for the latest updates! ET is proud to bring you this new sneak peek of new scenes from the action-packed film, as well as never-before-seen interviews with cast members Jennifer Lawrence, Josh Hutcherson, Liam Hemsworth, Elizabeth Banks, Woody Harrelson, Wes Bentley and Alexander Ludwig. What do you think? I totally cannot wait for the movie to come out! Remember to follow us on Twitter at @HungerGamesSG and Like us on Facebook! While we had posted yesterday about the new “The Hunger Games” TV spot which showed more scenes from Capitol, we are pleased to find the full HD video is now available in Capitol TV Productions! Please excuse us while we go back to re-watching this TV spot again and again! ‘The Hunger Games’ will be released in Singapore on 22 March 2012. Book “The Hunger Games” tickets from Cathay Cineplexes now! Don’t forget to follow us on Twitter (@HungerGamesSG) as well as ‘Like’ us on Facebook for the latest updates! Many of your dear readers like us, couldn’t make our way across the globe for “The Hunger Games” cast mall tour. No worries though! Westfield Century City has provided this video of their appearance on YouTube! Head over to Westfield Century City Facebook page for exclusive photos! Many thanks to @tausuan for the tip! 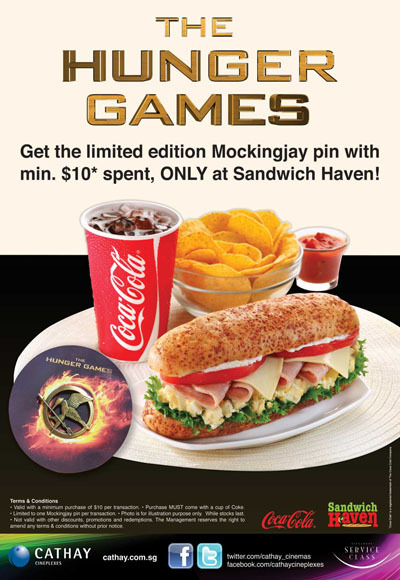 Spend Minimum $10 In Sandwich Haven And Get Lionsgate Mockingjay Pin! Do you want to own a Lionsgate Mockingjay pin? 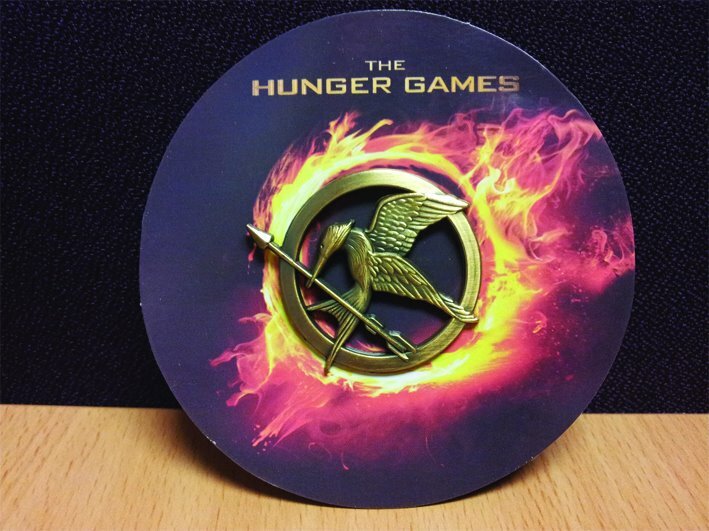 Cathay Cineplexes is partnering with Sandwich Haven to give away Mockingjay pins! Check out what you have to do after the jump to get the much coveted Lionsgate Mockingjay pin after the jump! Get the limited edition mockingjay pin with min. $10* spent, ONLY at Sandwich Haven! Valid with a minimum purchase of $10 per transaction. Purchase MUST come with a cup of Coke. Limited to one Mockingjay pin per transaction. Photo is for illustration purpose only. While stocks last. Not valid with other discounts, promotions and redemptions. The Management reserves the right to amend any terms & conditions without prior notice. Sandwich Haven can be found in the level 5 of The Cathay and Cineleisure Orchard respectively. We suggest heading down as soon as possible to avoid disappointment! A fan has captured this new “The Hunger Games” TV spot with many new scenes. Many thanks to Hunger Games Philippines for the tip! Yahoo! Movies Debuts New “The Hunger Games” Clip With Katniss Meeting Cinna! Lenny Kravitz went on The Ellen DeGeneres Show and to “The Hunger Games” fans delight, a short “The Hunger Games” clip of Katniss Everdeen (Jennifer Lawrence) meeting Cinna (Lenny Kravitz) for the first time was revealed during the show. Yahoo! Movies debuts a longer version of the said clip in full HD online. We couldn’t embed the clip so click on the picture below to watch the clip over at Yahoo! Movies! What do you think of this clip? Comment below and tell us what you think about it! Do you like it? Was it what you had imagined? Video of the LA mall tour is released! 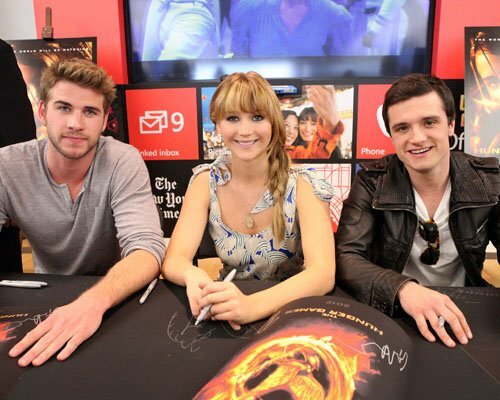 [from left] Liam Hemsworth, Jennifer Lawrence and Josh Hutcherson during the signing event. 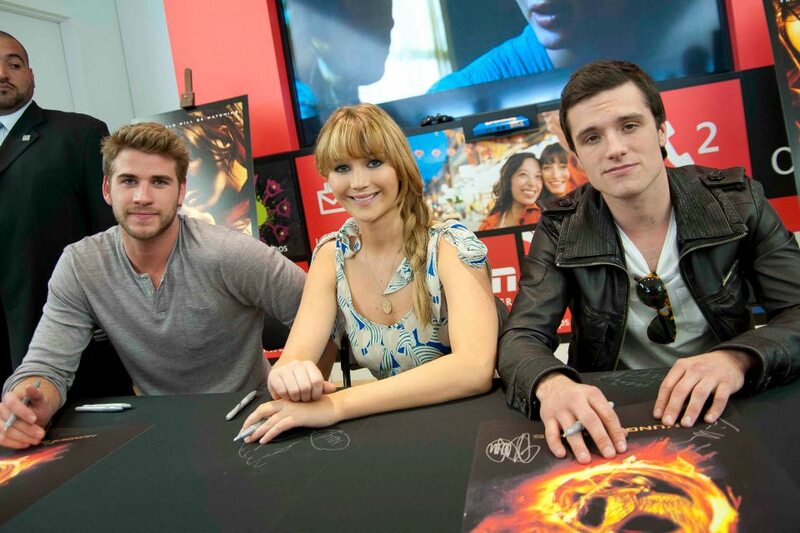 As LA is the first stop of The Hunger Games mall tour, there were many fans there. A video has been released, which shows the interaction between the cast and some questions were answered. Shop In Plaza Singapura And Stand A Chance To Win “The Hunger Games” Movie Premium! 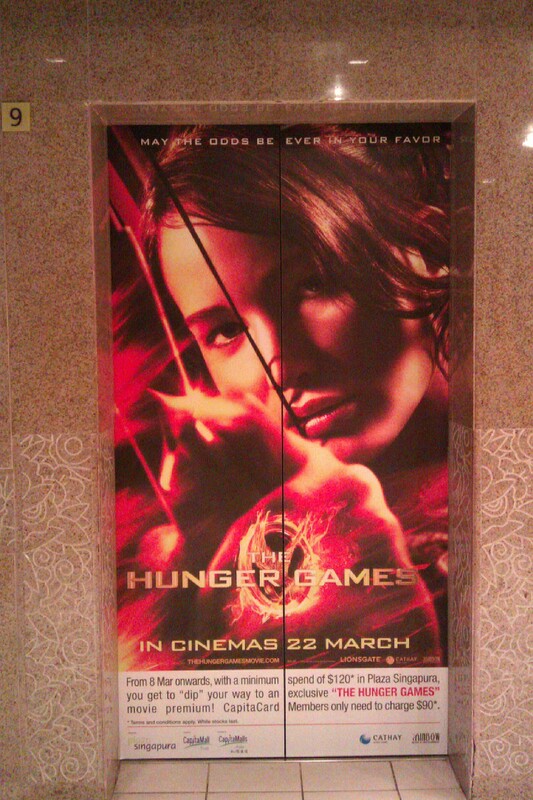 This poster was spotted on the doors of the lift on level 7 in Plaza Singapura. From 8 Mar onwards, with a minimum spend of $120* in Plaza Singapura, you get to “dip” your eay to an exclusive “THE HUNGER GAMES” movie premium! CapitaCard Members only need to charge $90*. * Terms and conditions apply. While stocks last. Will you be spending at Plaza Singapura for a chance to win “The Hunger Games” movie premium? We couldn’t help wondering what kind of movie premium shoppers will stand a chance to win! Do tell us what it is if you “dipped” your way to winning “The Hunger Games” movie premium by leaving a comment below! Win “The Hunger Games” Movie Premiums From nEbO! nEbO is giving away 5 sets of “The Hunger Games” movie premiums which includes an A4 folder, a notebook, a Mockingjay pin and a movie poster! This contest is open to non-nEbO members too. Contest details after the jump! Q: What is the item in THE HUNGER GAMES trailer that represents good luck? Then head over to nEbO here to submit your personal particulars along with the correct answer. 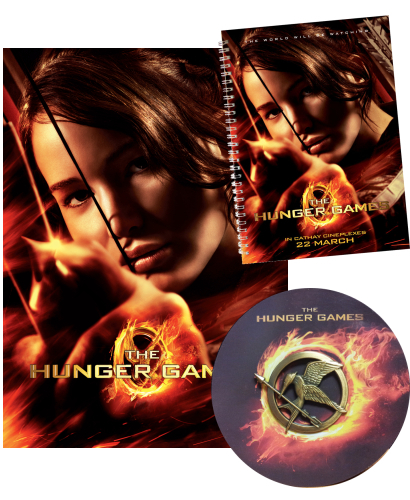 *Each set contains an A4 folder, a notebook, a mockingjay pin and a movie poster. Prizes will be awarded to every 20th entry (limited to the first 5) with the correct answer. Results will be announced on the contest webpage by 30 Mar 2012. Winners will be notified by email. By participating in this contest, you agree to receive future communications from nEbO via email and SMS. May the odds be ever in your favour! Thank you Felicia for the tip!